Especially popular during the fall, the triangle-shaped candies have a vanilla-marshmallow taste and chewy texture. This Halloween classic is available all year long. Will all of that rich taste, candy corn is fat free! 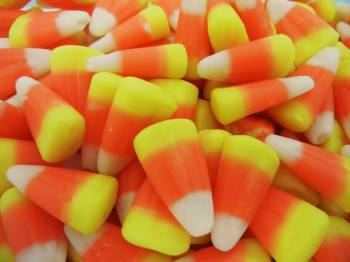 We all know how deicious candy corn is to eat, but their visual appeal makes them a fun holiday decoration. String some into a garland, hot glue some to a wreath form, or fill clear glass jars with them for a pop of fall color.